When the temperature drops and you’re tasked with bringing a dish to a potluck, don’t arrive with a cold casserole. Instead, make a simple insulated casserole carrier that conveniently stores your dish so it will arrive warm and ready to serve. Take it a step further and combine one of these patterns with stylish fabrics that match the event! 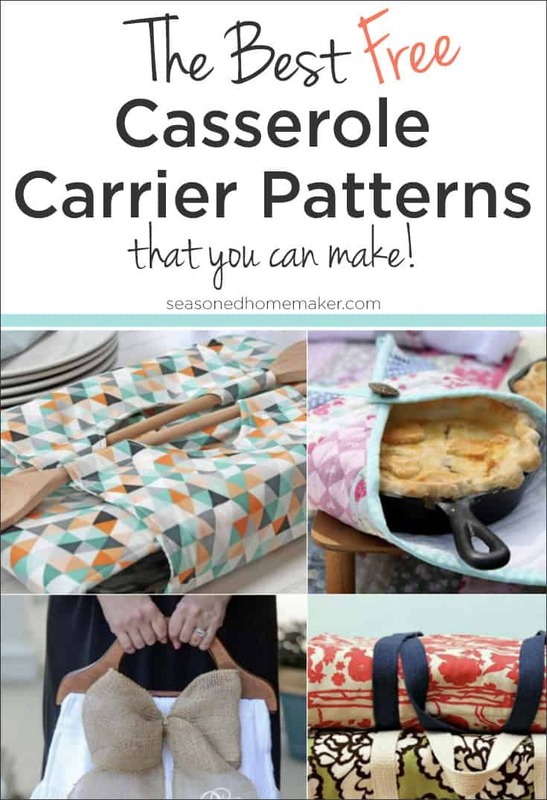 I’ve gathered a few of my favorite casserole carrier patterns that are easy to make and will ensure your dish arrives warm and ready to serve. This stylish pattern attaches serving spoons to the top. What a great idea for carrying a pie to your next event. These are so simple you could make one for yourself and one to leave behind for the hostess. This Southern gal loves a monogrammed casserole carrier that can also double as a purse. Brilliant! Which came first, the chicken or the egg? Make your casserole cover in a whimsical fabric to brighten the event! This pattern is perfect for beginning sewists. The piping on this casserole carrier adds a real touch of elegance. Not all casserole dishes are rectangular. Try this pattern for round casserole dishes. To be honest, I never thought about adding a zipper. Amazing! What a genius idea. Use quilted placemats to create your carrier. 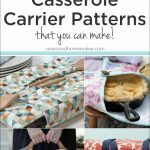 Casserole Carriers and Covers can make great gifts. Most of these patterns are easy to make. If you’re carrying a dish to Thanksgiving or Christmas dinner, I suggest making one that the hostess will love and leave it as a gift. If you want to get really creative, add some applique or machine embroidery that matches the occasion. Either of these options will personalize the Casserole Carrier. P.S. 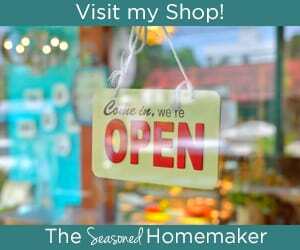 If you love this post, please share it on Pinterest and Facebook. It would mean the world to me.